The faux suede technique can add a lot to your handmade greeting cards. I love the soft texture it creates and the added tactile element it allows you to place on your projects. Find out how to make some here. Is that paper? It feels so soft and looks like material!" 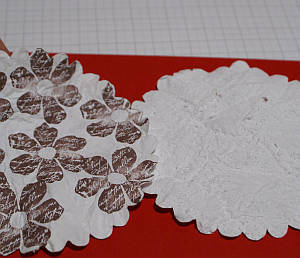 Treating cardstock this way can add texture and visual appeal to your handmade greeting cards or scrapbook pages. 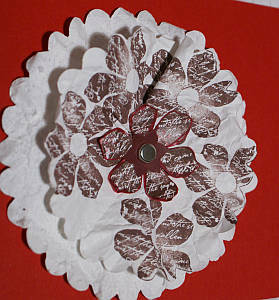 You can make some from ordinary cardstock, your paper crimping tool and your bare hands. If you have used this method before, I hope you will show me your papercraft project. Scroll down the page to add your picture and tell me something about it. Did you know that cardstock is made in layers? You can take advantage of that fact and make yourself some lovely elements with the thinner layers of it. Your aim in this technique is to separate those layers to create the faux suede technique. You will wind up with soft, fluffy layers on one side and the smooth cardstock on the other side. First punch a shape out of cardstock, stamp it if desired, then run it through the paper crimper quite a few times. I chose a large scallop circle shape and ran mine through my crimper about 8 - 12 times. Be sure to run the paper through in different directions. Your aim is to break down the fibers in the paper so that it is easy to split into layers. If you are using your hands, crumple, flatten and re-crumple the cardstock over and over.Cardstock is strong and needs to be worked over to separate its layers. 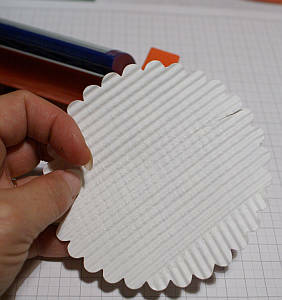 Now if you have used a paper crimper, finish by crumpling the cardstock between your palms, rolling it and softening it even further. 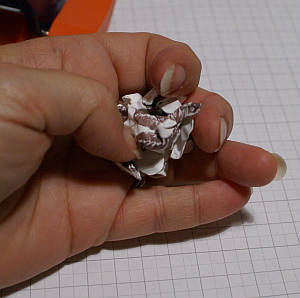 Next, spread out your crumpled cardstock and then carefully prise apart the edges of the softened paper. Work carefully so you do not tear the delicate layers, and you should be able to completely separate the cardstock into two layers. If you cannot yet do this, work the paper a bit more between your palms or put your cardstock shape through your crimper a few more times. 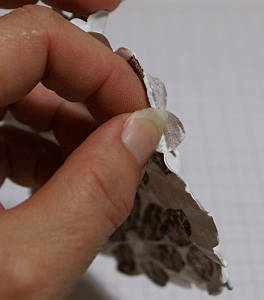 Keep going until you can delicately separate the paper into two layer. Some kinds of cardstock may have more than two layers, but I like to use the Stampin' Up! cardstock and just have two layers at the end. Now you have two layers of paper, one with the smooth finished cardstock surface (a bit crumpled now though. Lol!) and one with a softly textured finish. There are many ways you can use your new embellishments. 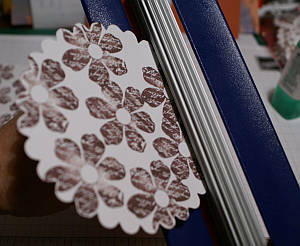 You can stamp on the cardstock before you run it through the crimper, or heat emboss it or distress ink it. Spray it with glitter or shimmer. I think it adds to the interest of the embellishment to have other colours peeking out from underneath. I also layer the split papers to add even more dimension and texture to my work especially when building a handmade paper flower. Use the faux suede technique to add softness and extra cuddliness to your baby lambs, chicks and monkey shapes, to clothing and hats and shoes to dress your paper dolls, and to landscapes of soft grass or trees. Make a faux suede element out of a strip of cardstock or a curved Big Shot element and use it to look like ribbon. NOTE: ALL cardstock will split into two if crumpled, by the way. You can use other colours than white. I hope you are inspired to use this method in even more creative ways and that you will share them with me when you do. 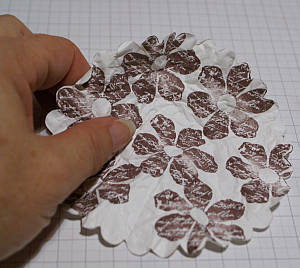 Now you have tried this technique, you might like to try making paper flowers or how to make a customised envelope.